Throughout this year, Pneuvay has dramatically increased its volume of supply of pneumatic conveying equipment and systems to the UK, USA and the Asia Pacific region by 30%. These products include pressure pots, air slides and rotary valves. 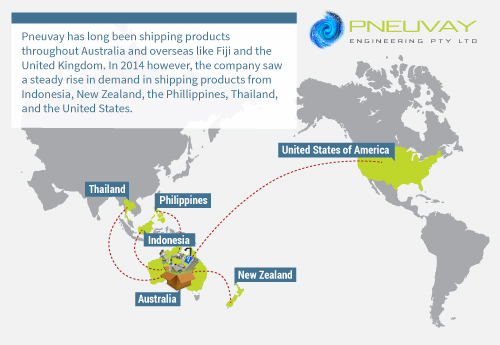 This map shows the various destinations of Pneuvay Engineering's equipment. 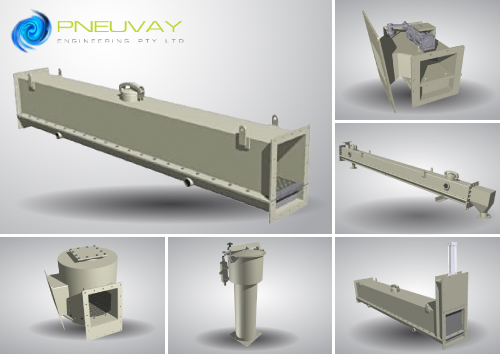 Pneuvay pressure pots conveying systems are dense phase conveyors designed for material transferring applications. Compressed air is injected into the lower chamber which then permeates through the media and "fluidises" the product. 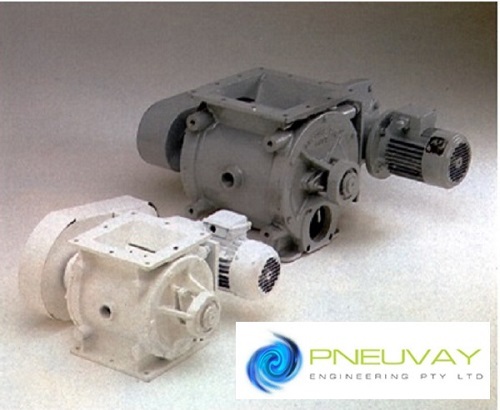 These rotary valves are used extensively in applications associated with pneumatic conveying and dust filtration. As the demand for Pneuvay Engineering's equipment, systems and products expands to other regions of the world, it has become essential for them to update their About Us page. From a simple page which contains the major services of the company, it has been transformed into a one-stop-portal for anyone wishing to know more about one of the leading pneumatic conveying companies in the UK, USA and Asia Pacific. The new "About Us" page is about the people. It is about the people that made Pneuvay what it is today — a brand trusted by many to deliver efficient pneumatic conveying, bulk materials handling, industrial vacuum and dust collection systems. It is about the leaders of Pneuvay and the companies they have worked with through the decades. It is also about the people looking for efficient pneumatic conveying systems within or outside Australia. But it also extends to people searching for pneumatic conveying company information either for their news article or research paper. 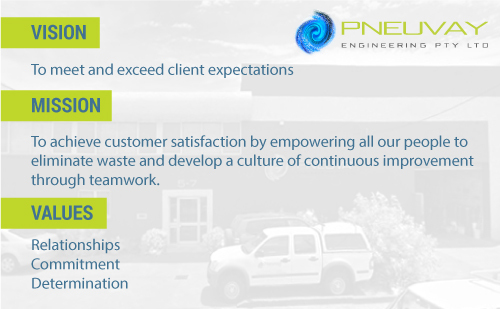 Pneuvay shares its core values to the world - the driving force which pushes it to deliver excellent services to its clients. Read more about Pneuvay's vision, mission and values. 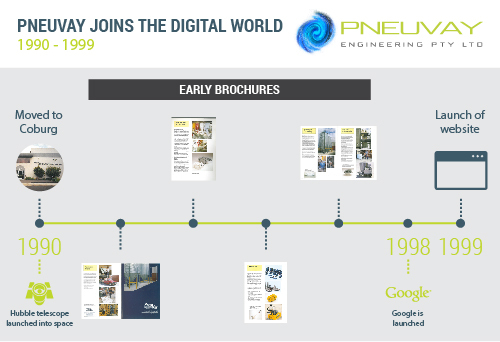 Travel back in time and see the growth and expansion of Pneuvay Engineering from 1982 up to the present. 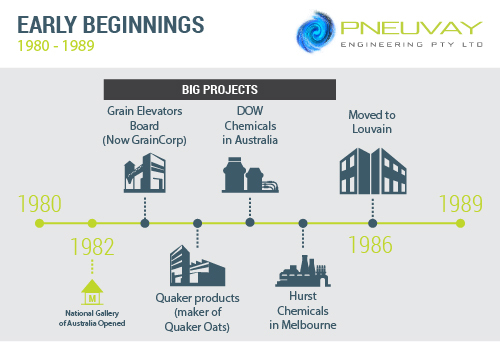 1982 witnessed the birth of Pneuvay Engineering - the same year as the National Gallery of Australia opened. The world rejoiced as the Hubble Telescope was launched into space in the year 1990. But back in Melbourne, Pneuvay Engineering was also celebrating as it moved to a bigger and larger office and factory in Coburg. The timeline above shows the other highlights of this decade. Sydney hosted the Olympic games in the year 2000. A year after, Wikipedia launched its website and it soon became one of the fastest growing websites in the world. Pneuvay on the other hand, completed numerous projects. 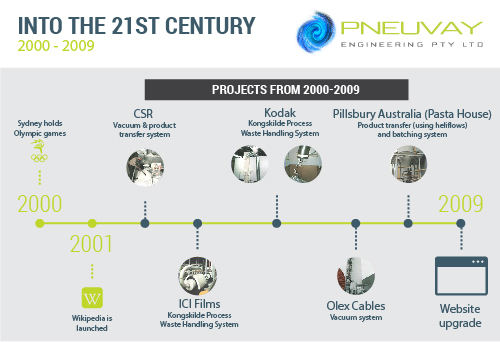 This timeline shows the various projects they have completed from 2000 to 2009. 2010 to 2015 was a period of a growing number of countries seeking the company’s products, such as air slides, rotary valves and pressure pots. 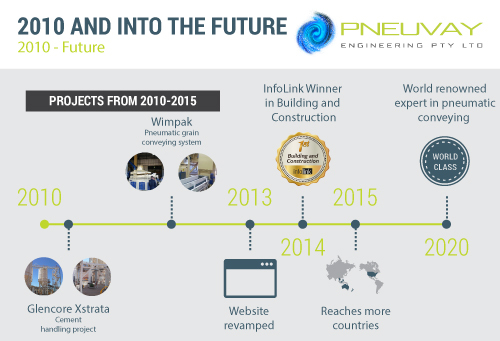 This timeline shows Pneuvay Engineering from 2010 and into the future. Pneuvay's About Us page is now more than just a reference for information. It is a testament to the company’s commitment to improvement. Share your thoughts. Do you feel the same? Post your comments via our social media pages through LinkedIn, Facebook, Google Plus, Twitter, and YouTube, or via our contact form.